I was at the local FedEx store yesterday to print out some documents, scan, and email them (my office printer/scanner broke) to ensure I have health insurance coverage for next year–perhaps a bit last minute on my part. To my surprise I was given a great example of how to incentivize QR code use. While I was there waiting to get some help I noticed a sign with a QR code right at the register. On the sign was a great call-to-action titled “We listen” in bold print. Below it the call to action asked for the customer’s feedback on their experience, and in return they will receive a coupon towards their next purchase. 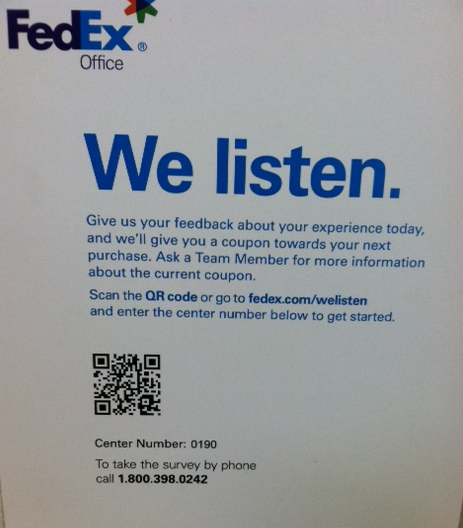 When you scan the code you are then taken to a FedEx mobile site that lets you quickly and easily give your feedback about your experience in the store. 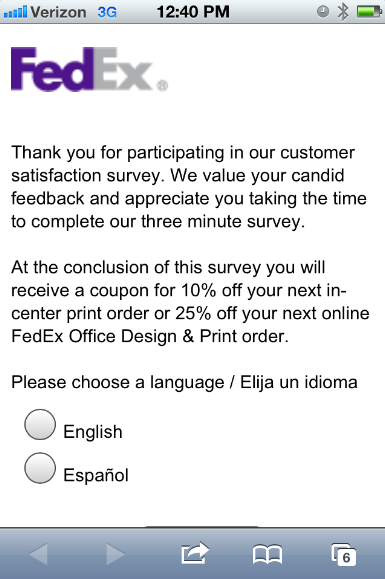 Upon completing the survey you are given a coupon for 10% off your next in-center order and 25% off your next online “FedEx Office Design and Print order.” Not a bad deal for one minute of your time. It is this sort of coupon offer—or it could be some other similar financial benefit or offer—that can drastically help drive QR code scans. In this particular case FedEx may want to collect customer data to see where they might be able to improve their service, or make things more efficient, so they need to find a way to collect data. 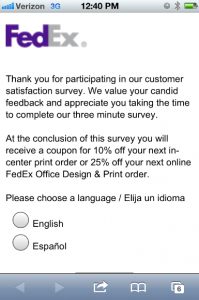 With a QR code, and a coupon offer to go along with it, they create a good incentive for customers to give their feedback but also, in turn, help to drive future sales with the same coupon. Obviously this FedEx example is just one of many. Perhaps, for another example, if you wanted to drive downloads of your mobile app you might include a coupon, or free shipping, or special deal for anyone who downloads the app. People enjoy these sort of deals and will take a few seconds out of their day for them. So no matter what your end goal is, if you can offer a free (besides the cost of time) financial incentive to your customers, you should see an improvement in your QR code conversion. Incentives work, so give incentives to you customers; both parties will be happy in the end. One of the many great uses for QR codes is on product packaging, and recently while I was at the super market doing my usual food shopping I was reminded of just exactly why this can be such a great use. Every individual acts, and every act is a reasoned decision—some more properly reasoned than others. When it comes to making decisions about what foods to purchase there is no difference. People choose foods based on any number of reasons, from tradition, to taste, to cost, and nutrition. Some of these reasons may be more cemented in stone than others, but most can be changed if given the right incentives and/or information. This is where QR codes come in. A QR code on your product packing is simply a tool which, in the case for food stuffs, is meant to help drive sales, and/or provide additional value and information to current or potential consumers. 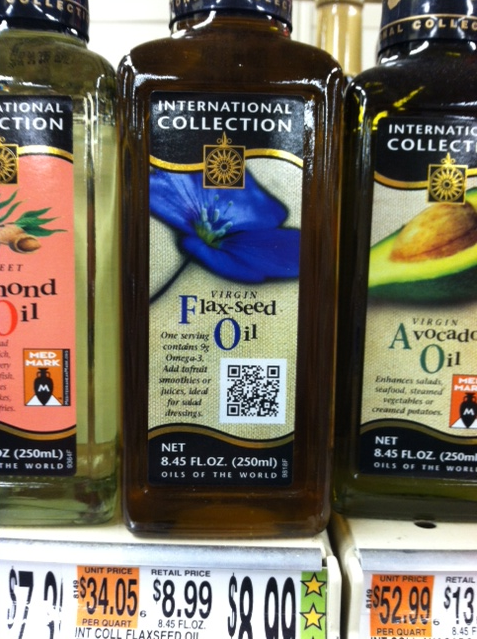 Take this International Collection Flax-Seed oil I saw at the store. Though it may lack a call-to-action, and a mobile optimized site, it serves a purpose (even if it could be greatly improved). 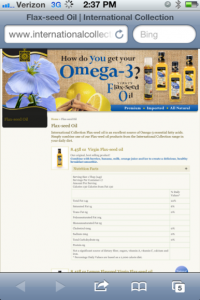 When you scan the code you are given more detailed nutritional information, a YouTube video on cooking with Flax-Seed, numerous ways to use Flax-Seed in your diet, a list of the many flavors they have, and an option to purchase them online. This QR code, if presented properly with a good call-to-action, has the potential to convince non-flax-seed users to switch over from say a vegetable oil or some other oil; convince current users to use more by presenting them with new and creative ways to weave the oil into their diet; or get current users to try new flavors of their favorite oil and purchase them online. This can be done for almost any product on the super market shelves and is an inexpensive way to drive sales, particularly since few products use the QR code tool as of right now. Use the QR code to differentiate your product from other similar competing products, explain the benefits of doing so; find out why consumers generally choose another product over yours and market towards converting those consumers, or simply try and use your code to drive your online sales if applicable. There are many possible ways to use QR codes to connect with consumers and benefit all parties involved, it’s time now, if you aren’t using this tool, to get on board and stand out among your competition. I even, just by happenstance, know of a company that might be able to help. I was at the Alpine Shop—a ski, snowboard and winter apparel store—in Burlington, Vermont last week and was searching for some new technical apparel for the ski season. Most of the apparel all looks similar, and rarely can you fully understand why one style costs so much more than another. Unless there were a bunch of employees working the store all with an expert depth of knowledge on the subject, you likely have to figure out the difference for yourself, or with minimal help from employees (who aren’t always, and can’t be expected to be, experts on each item in the store). 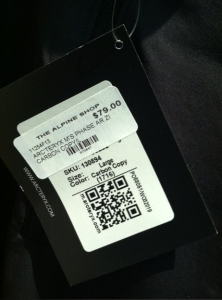 So I was walking around checking out the different apparel options and not really making much progress, until that is, I found a brand of technical wear that included QR codes on their tags. As you might have guessed I was like a child on Christmas morning. When the QR code was scanned it directed you to a mobile optimized page that explained everything you could possibly need to know about that particular piece of apparel. Everything from the purpose, to the features, the materials, and more was at your fingertips. It was simply genius. Now I didn’t need an expert employee. 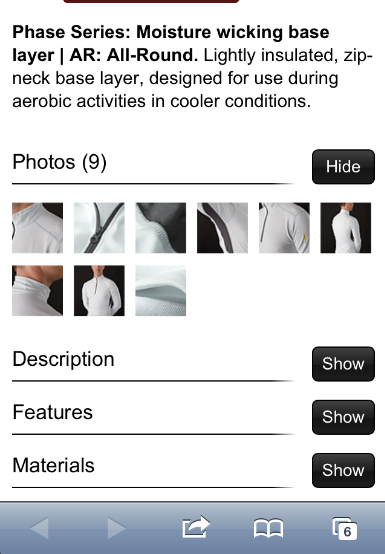 I could finally figure out what was what because some forward thinking company (Arc’teryx) decided to make everything easy for their customer and retailer, by providing the information that is important in making the proper decision about their technical apparel. 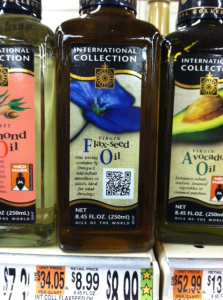 It is this sort of additional value that QR codes can help provide, and in turn, help drive sales. Do you think I purchased a product that I could find little to no information on, or the product that gave me every technical detail I could ask for, including its preferred purpose for use? Giving customers the information they need to make educated decisions is a great way to help all parties involved. And particularly because so few companies in the market use this tool right now, any company that does is sure to stand out and reap the rewards. Don’t get left behind. If you are a technical apparel company or some other business where proper decisions should be based off better information, you should strongly consider using QR codes to help provide this information to consumers at the moment they are making their purchasing decisions. People underestimate just how useful a QR code can be to help increase sales or provide interesting content for consumers that they would otherwise never be able to capture or access. My friend, however, was at Target the other day and found a perfect example of how a QR code, with a bit of creativity, can be used to help drive sales. In this case, specifically Target gift cards. 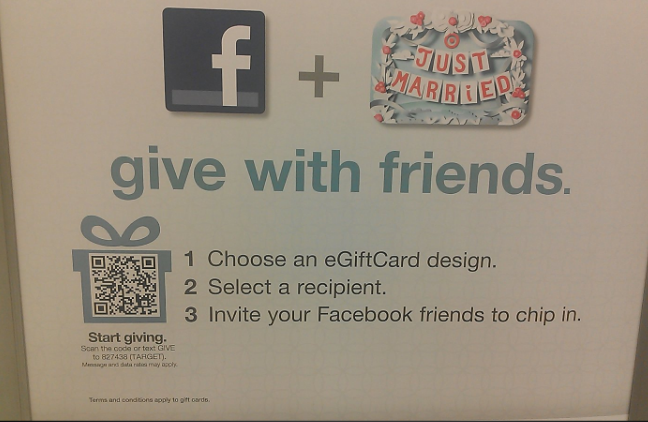 As you see in the photo (right), Target put up advertisements in certain areas of the store enticing shoppers, in this case specifically people who might be wedding shopping, to purchase gift cards. 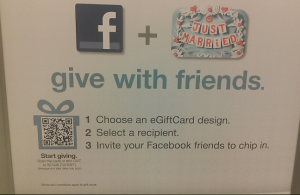 But what makes it particularly neat is that they created a system where, upon scanning the code, you can invite your friends to join you and chip-in towards a single gift card for, in this case, the bride and/or groom. This is a great way to entice people to purchase gift cards, but it also creates a fun experience for consumers, and let’s them join up with their friends to give a much larger gift together. 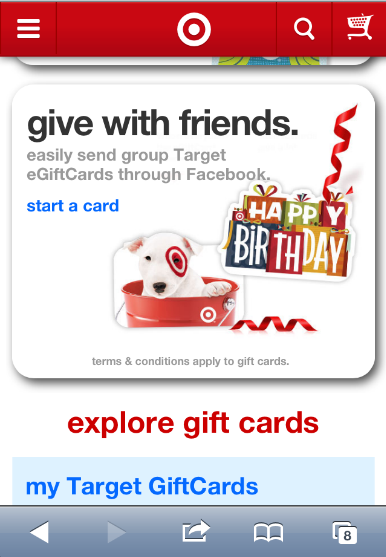 This in-store QR code use by Target wasn’t only directed at shopping for weddings, but was, and can also be used to give group gifts for birthday’s or other special occasions. Besides this cool group giving feature, they also advertised around the store that you could simply scan the QR code to give Christmas gift cards with ease; advertising how easy it is to scan the code and give cards with your phone. 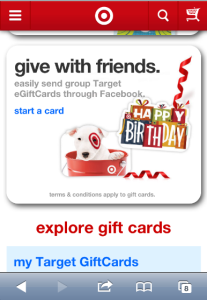 By using QR codes, coming up with some creative uses for them, and clearly stating their use through good call-to-actions, Target found a great way to help drive gift card sales with only a minimal investment. QR codes should never be underestimated. With a little creativity and proper use, QR codes can help you drive sales, increase brand interaction with consumers, provide added value, and even create free advertising through social media. If you aren’t using them now it’s about time you caught up with the 21st century. I was doing last minute Christmas shopping and was standing in the check-out line at Best Buy that wrapped almost half way around the store; an absolute nightmare for sure. While standing in line for a good 30 minutes can never really have a silver lining, it did place me in the DVD section for a few minutes where I discovered a great example of how QR codes can help prevent lost in-store sales. You should all be happy that my misery has brought you this wonderful blog post. If you are a retail store like a Best Buy, you can often lose in-store sales to issues like low inventory, poor selection of product, and “showcasing” (when people use your store as a place to view product which they will then go purchase online). Preventing these lost sales can mean a huge boost in sales and profits, but the question is how this is possible. You probably were not expecting it, but the remedy has something to do with QR codes. If you look at the photo I took (right) of the Best Buy shelving, you will notice that there is a QR code with a great call-to-action stating “Can’t find the title you are looking for? Scan the QR code…”, it then goes on to inform the consumer that they will get free shipping on their online orders (there are also other QR codes with different calls-to-action, some which can be scanned to help find gift ideas). What Best Buy has attempted to do here is catch those possible lost sales from those potential reasons I mentioned above. First, if Best Buy is low on inventory the consumer, without the help of store staff, is prompted to order whatever it is they are looking for online through the code. Second, if the DVD or CD is not sold at the store the consumer has access to greater titles on the Best Buy website, which they will now know due to the call-to-action, and can act immediately through scanning the QR code. Third, for the consumer who is ‘showcasing’, if they find the item they are wishing to now purchase online, they may re-think their purchase since they now see Best Buy is offering them free shipping on their online purchase by scanning the QR code. No, QR codes will not stop all lost sales, but putting this sort of inexpensive option in-store to help at least prevent some of these is an obvious potential remedy. Just make sure your call-to-action is big enough to be seen, and clearly states why the QR code is there. The internet age for many physical retail stores may seem like the enemy, but you can lessen the threat, and even use it to your advantage if you just adapt to it and use your creativity. 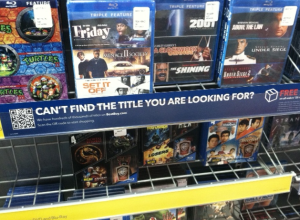 Best Buy is a perfect example of this.